..."I've tried to organize my home but it never stays organized." Well, let me tell you this - your home can be organized and stay organized. And I'm going to show you the home organization plan that saved me from my disorganized home. Before we start let me confess that this plan will take time to create and implement, but once you're done with the initial work your housecleaning will be a breeze. Now let's get started on the three actions you need to take to create an organized home. Yes minimalism, read more about how I started here. Before you can start getting your home organized you need to get rid of stuff you no longer need, want or desire. This is an important step otherwise all you would be doing is rearranging stuff and being the best stuff manager you can be. The dream of your organized home will never be accomplished this way. Step 1: Make note of your messy areas on paper. Get a note book or loose pages. On the top of the first page write the name of the room you want to declutter and organized like, 'Kitchen' or 'Bathroom'. Below the room name draw two lines down the middle of the page. Now you have three columns. Name the first column header as 'Messy Spots', 'Problem Spots' or 'Broken Windows'. The second column can be named 'Solutions' and you can name the third column 'Time'. Step 2: Evaluate the room. Look at the room that you want to start with. Write down all your problem areas you want decluttered and organized in the 'Messy Spot/Problem Spots' column. Once you've come up with your list it's time for the next step. Step 3: Write down your solutions in column two. Try your best to come up with a solution for each problem spot listed in the first column. Have fun with this and be creative. Seriously consider the stuff you don't need or use anymore. Forget about, "I might need it later," and try to remember the last time you used something. If it was more than a year ago, please do yourself a favor and get rid of it. Donate it, give it away, sell it or just trash it. Because dear reader, it's not worth the time and energy you spend, cleaning around, looking at or trying to organize unused stuff. In the time column write the amount of time you think each task will take. This is only an estimation, but as you continue to work the plan you will notice that it takes less and less time to get things done. Using your house cleaning schedule write down when you will be able to do each task. 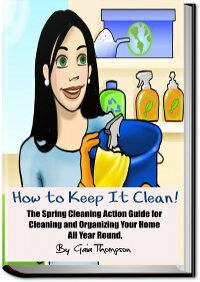 If you don't have a house cleaning schedule, you can create your own using the guide here. Also, using checklists are a great way to make sure you cover everything. When it's time to tackle a problem area don't put it off. Just do it! Otherwise, it will still be there tomorrow. I'm sure you don't want that. Once you have finished decluttering, it's time to organize the stuff you have left. That is, find everything a logical home and make sure that everyone living with you know where these homes are. In this way, when it's time to do a clean-up, no one has to ask you where anything goes. Have a maintenance system in place to monitor the "broken window" zones in your home. Never allow things to pile up, like mail, or the dishes or laundry. Or allow toys to remain on the floor when they are not being used. Allowing pile-ups, leads to disorganization and you don't want that. So have your maintenance system in place to take care of pile-ups at least once a day. Finally, follow the above actions with other rooms in your home. Remember, home organization is possible and sustainable. All you need to do is be consistent and work your plan. You Can Find What You're Looking For With these Home Organization Tips. Make The Most Of Closet Shelving. Kitchen Cabinet Organizers: A Real Timesaver. How To Clean and Organize a Closet.